Sprawling three level country estate. 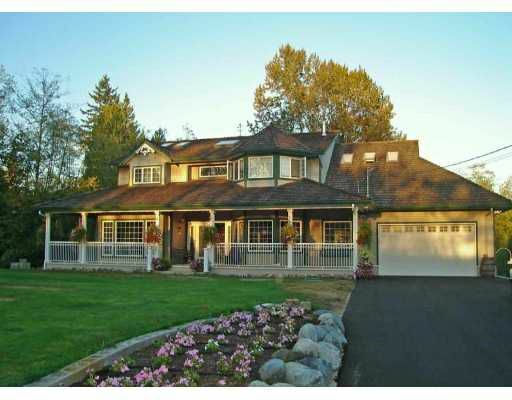 One of the finest home in Maple Ridge. Hardwood plank flooring throughout. Formal dining room and sunken formal living room. Incredible gourmet kitchen features commer cial gas stove and double wide fridge. Bring mum and dad - they'll love the spacious daylight 2,000 basement suite. Suspended slab garage has a professional workshop underneath. Summers will be a blast! Th e entire family will enjoy the above ground pool and lazy days sitting on the wrap around deck. Revenue generating 30 x 50 greenhouse (which has Farm Tax status) + a private three bedrooms home featuring h ardwood floors, new siding, new roof and full basement. This home is truly sensational and a must see. All this situated on 3.6 acres!